After breakfast we went to the specialized wine shop La Estación on the Balcarce Ave. and bought some good wines to take back to Portugal. After that Volker got a haircut at a local men's hairdresser. Then we walked to the Mercado Municipal where I bought Menthisan (almost the equivalent of my favourite medicine Mentholatum, but instead of coming from Peru it comes from Bolivia). We strolled through the mercado, bought some presents and were very keen to have a snack, but we had to leave to the airport. We gave our car back, a Ford Ranger, driven kilometres: 2098 km. 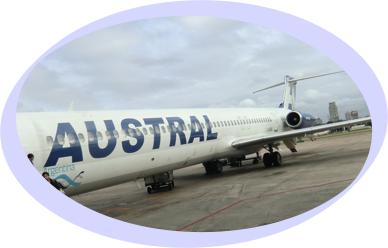 Flight to Buenos Aires with Aerolineas Argentinas/Austral, although we almost took the wrong airplane as there were 2 boardings at the same gate to 2 different destinations without clear signalisation. A chauffeur waited for us and took us to our booked hotel Mansion Vitraux which has only 12 rooms. But we were not satisfied with our room, it had only windows to the inner hall of the hotel and there was an unpleasant strong smell in this room. We couldn't stay in this room and they didn't have any other room available we called our agent and asked to change. This was not an easy task because most hotels are fully booked. We ended up in the Loi Suite in the Marcelo T. Alvear, room 602A (unfortunately pretty noisy but very nice people). 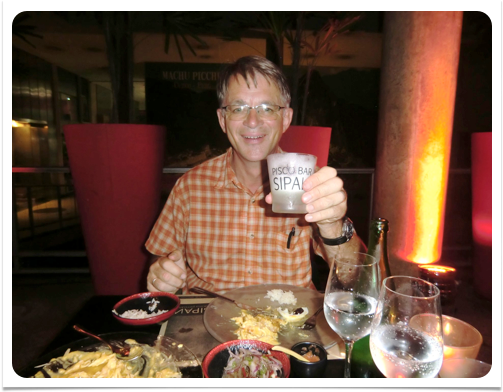 Having dinner with Pisco Sour at a Peruvian restaurant close to our hotel.